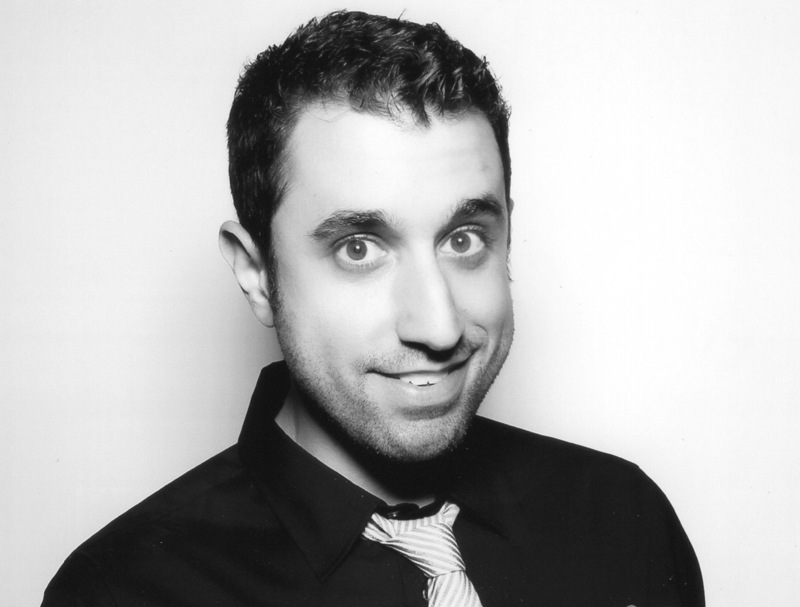 Jake Monaco is a multi-talented composer who has worked on a variety of projects for film and television. His music will be featured in Fox’s highly-anticipated action comedy “Keeping Up With the Joneses,” starring Jon Hamm, Gal Gadot, Isla Fisher, and Zach Galifianakis. He is also currently scoring three family-favorite animated series, “The Stinky and Dirty Show,” Netflix’s “Dinotrux,” and Warner Bros. Animation’s “Be Cool Scooby Doo.” As a producer and composer of additional music for Christophe Beck, Monaco has contributed to the animated magic of “Frozen,” the record-breaking laughs of the “Hangover” trilogy, the furry hijinks of “The Muppets,” and the award-winning documentary “Waiting for Superman.” What he loves about composing for movies and television is creating music that tells the story. He took time from his busy schedule to answer my questions. When did you first realize, watching a movie, that someone composed a score that helped tell the story? My favorite movie as a child was Ghostbusters and although I didn’t know anything about Elmer Bernstein at the time, I remember the music being an integral part of the story. What was the first composing job you got paid for? I was accepted into the USC film scoring program 2006-2007. My first paid gig was with a director named Zeus Quijano on the short “Point of Entry”. A few years later he turned this 5 min short documentary into a 20 min version, which I was also lucky enough to work with him on. He is hoping to turn it into a feature eventually. Fingers crossed! At what stage do you usually come into a project? Before or after filming has been completed? It completely depends on the project. Some smaller projects, I have started working on themes or sound palettes prior to shooting, or in the case of animation, during the storyboard phase. Although on the last two features, I’ve been brought on only a few weeks before completion. I had two and a half weeks for “Absolutely Fabulous” and five weeks for “Keeping up with the Joneses.” It’s kind of exhilarating to be under that sort of deadline; adrenaline gets you through! If you could go back in time and score any movie, what one would you pick? When you work on a film that mixes genres, like the action comedy “Keeping Up with the Joneses,” how is that reflected in the music? I try to make the action sequences as fun as possible. While there are still stakes in the film, the music doesn’t have to play them so seriously, it’s ok to have fun! There’s a long, exciting chase sequence in the middle of “Joneses” that, while it has a driving beat and action elements, has a funk horn section and some crazy EDM synth interjections. The comedy is really all about timing; when is the perfect moment to drop out. A lot of the time, a joke plays funnier when the music pauses for it as opposed to commenting on it. Did you incorporate any unusual instruments? Without giving away too much, there is a running theme through the movie about the Joneses going to this little café in Marrakech in Morocco. So I did a little research and found some instruments native to that region that are sprinkled throughout the score. The two most interesting being the Sintir (or Gimbri), which is a 3 stringed mid/low register plucked instrument that has camel skin stretched over the body and the kemenche which is a bowed instrument that rests on the players knee and has a very distinct, almost nasal, tone to it. VidAngel has a service that will let you get edited versions of Hollywood films. I’m a fan of director Peter Berg. His excellent “Friday Night Lights” film has been eclipsed by the popular television series it inspired. And I like the much-derided “Battleship,” which I thought was a great example of well-executed action movie, taking its entertainment value seriously without taking itself too seriously. 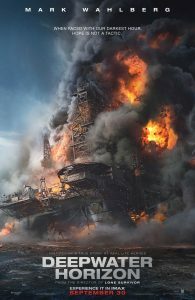 His new “Deepwater Horizon,” based on the 2010 explosion and sinking of BP’s Deepwater Horizon oil rig in the Gulf of Mexico, shows his skill in cinematic storytelling and his gift for pacing and action. But it is curiously constructed, as though for a fictional story more along the lines of Bruce Willis fighting a meteor than a real-life environmental catastrophe that killed 11 people and spread an estimated 3.19 million barrels of oil into the Gulf. It should be an action-movie version of “The Big Short.” Instead, it’s an updating of “The Towering Inferno,” meaning — spoiler alert — the bad guy is the one who tries to cut costs. Berg and screenwriters Matthew Michael Carnahan and Matthew Sand follow the established formula for action films. The first ten minutes make us fall in love with the hero, his adoring wife, and adorable child. That’s not hard to do. The hero is Mike Williams, Mark Wahlberg, his wife is Felicia (Kate Hudson), and their daughter happens to be working on a report for school about Daddy’s job, which gives us a chance to find out about some very technical stuff in very simple terms. Daddy works on an oil rig out in the middle of the Gulf that pumps up oil from under the ocean. “That oil is a monster like the dinosaurs it used to be. My daddy tames the dinosaurs.” And Mommy will miss him very much when he goes. They are adorable. Got it. The next scene introduces us to hero number 2, the weary veteran who is all about competence and integrity, Captain Jimmy Harrell, superbly played by Hudson’s real-life dad, Kurt Russell. And then there are the guys in suits, who are all about making their numbers and therefore cutting the corners that the veterans knows are not there for show but are actually necessary. There’s a lot of jargon, but basically all you need to know is that the good guys understand that there may be a problem and the bad guys do not want to take the steps necessary to find or prevent it. And the good guys are really endearing, and therefore it all matters a lot. And then it all starts to blow up, and we get to the real reason for the movie, which is the “who will get out of this and how will they do it?” part. This is where Berg’s strengths really show, as each of the set-pieces are thrillingly staged. He has an exceptional clarity in conveying a three-dimensional space on screen — actually, several of them in different locations — and balancing the urgency of the action with genuine emotion. We see how the people on board think through the problems, from the logistics and the mechanics to the choices based in morality and courage. Wahlberg is, as ever, just right to play the guy you’d like to have next door, a decent, hard-working, family-loving man with enormous capability and integrity. Here, as in their previous collaboration, “Lone Survivor,” Berg keeps the focus on the challenges faced by individuals who have little control over the monumental, life-or-death tasks they are assigned by people far away with little understanding of the consequences of their orders. That worked better in the earlier film, as the story of the soldier far from command has existential implications that are inherent and instantly recognized. Here, the action is disconnected from the consequences that a brief text coda before the credits cannot make up for. Parents should know that the movie includes extensive peril and violence, with some disturbing images and characters injured and killed, some strong language, and sexual references and a situation. Family discussion: Why do the people on the rig use the term “Mr.”? Who could have prevented the explosion? 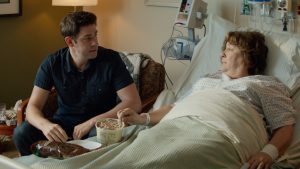 Producer Tom Rice (“The Way Way Back,” Mississippi Grind”) answered my questions about the endearing independent film “The Hollars,” with director John Krasinski starring as a confused young man about to become a father, who is called home when his mother is hospitalized with a brain tumor. The brilliant cast includes Margo Martindale, Richard Jenkins, Anna Kendrick, Sharlto Copley, and, as a kind-hearted church youth leader, singer Josh Groban. How did you first come upon the script? I read the script on an airplane and immediately fell in love with it. I was laughing out loud, I was crying – people were looking at me, and I didn’t care. I fell for these characters, and saw my own family in the Hollars. I fell in love with the sincerity and love these people have for each other – in the midst of the chaos and dysfunction. It’s such a special story, and it fits right into the Sycamore ethos. What matters most to you in the projects you commit to? Any project we greenlight has to fit the ethos of our company. The Sycamore mission is to make films with elements of redemption, reconciliation, social justice, or what Andy Crouch calls the “full human condition.” We don’t ever set out to make blatantly Christian films – but I hope everything we do will have some type of positive impact on our culture and community. What did John Krasinski bring to the film as director? Everything. It was his passion that kept this project alive during development. It was his vision that attracted the cast. It was his charm, humor and sensibility that’s organically infused in every scene. And it was his leadership that everyone got behind, every step of the way. John is a very well-loved person, and people will come out of the woodwork to support him. 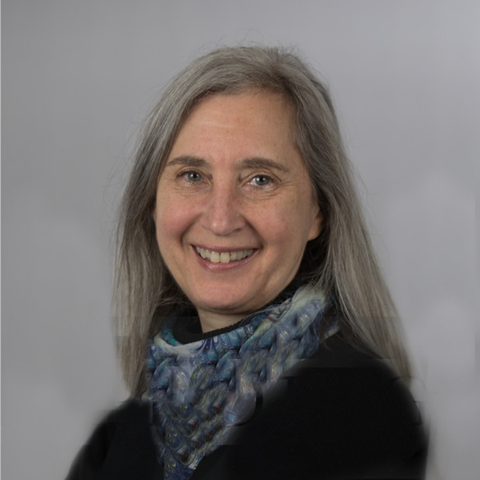 What do stories about loving but dysfunctional families help us understand about ourselves? Well, I think everyone will relate to this film in some way. For me, it’s about grace. Family is everything to me, but it’s not always easy. Communication, honesty, forgiveness, love – those are all necessary. We all need to be more giving in those areas, because we all need it to be given to us. It’s grace in action. We’re all messy, we’re all broken – and we all try to pretend like we’re not. When a story like this comes along and shines a light on that – with a perfect blend of heart and humor – I think it inspires us to let down our own guard a little – take of our masks, so to speak – and trust ourselves and our loved ones with who we really are. One of the film’s most endearing characters is singer Josh Groban as a church youth leader. How did he get the role and what does it add to the film? Josh and John are friends, and so Josh took the role when John reached out and offered it to him. Josh is perfect casting here. He brings such a likeable, calm yet authoritative presence to the role. He never has any passages of dialogue where he’s preaching – but his character has a strong impact on another character just by being patient and understanding with him – and this grace – there’s that word again – allows the other character to grow and change. It’s a beautiful and honest portrayal of a good man. Although it is not explicitly a faith-centered film, how does it touch on matters of purpose and connection? I really hope those discussions are about healing. How it’s never too late to make amends, or to grow closer without the burden of the past weighing us down. This is true in human relationships, and central to our relationship with God. We can meet God wherever we are in life, and He’s there for us. And I would hope everyone has someone in their life – a family member or friend – that embodies that. We are all built for community. We need each other, and this film is about our human need for those relationships in so many ways – especially familial.